Pictured (L-toR): Craig Huffines, AHA executive vice president; Eric Walker, 2015 AHA president; Meredith Doyle; Mike Doyle; and Steve Lambert, 2014 AHA president. 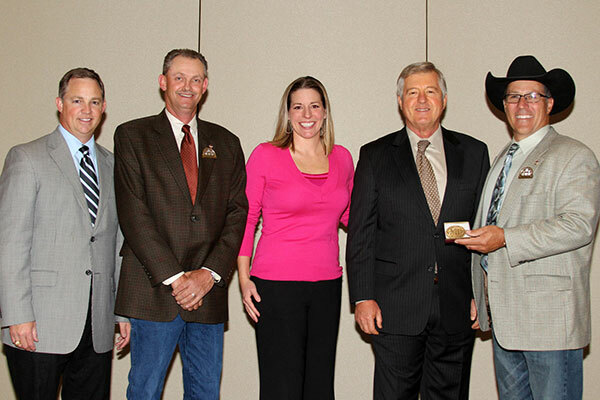 KANSAS CITY – In celebration of 50 years in the Hereford business, Doyle Hereford Ranch, Wolfe City, Texas, was honored as a Golden Breeder on October 31, 2014. The Doyle family was recognized at the Hereford Honorees reception during the American Hereford Association annual meeting in Kansas City, Missouri.